KoopaTV: "Miiverse Ended!" Text Datamined: So What? By LUDWIG VON KOOPA - What difference, at this point, does it make? If I asked you a week, month, or months ago, “Do you think Miiverse is going to end eventually?” you would say yes. It's an intuitive, natural answer. All things come to an end, and Nintendo's social network is clearly on its last legs. It's not being supported by the Nintendo Switch. The console it was built for, the Wii U, is no longer being supported. The other system that's piggy-backing on it with a post-development integration that they never bothered to complete, the 3DS, is on its last legs. “Anyone else get the feeling that Nintendo has FORSAKEN MIIVERSE? 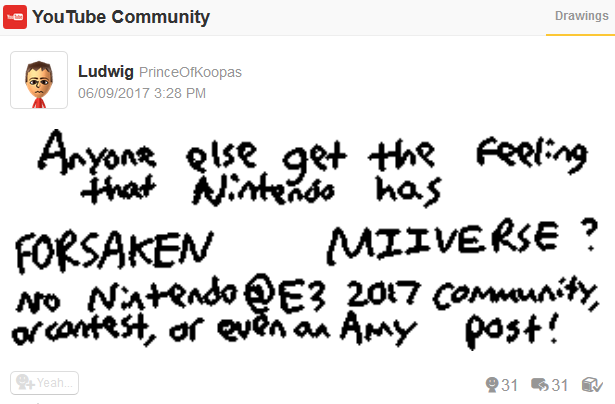 Nintendo always posted SOMETHING on Miiverse for E3. In previous years, they made a dedicated E3 discussion community, and sometimes held contests and stuff. Not in 2017. In fact, they haven't done ANYTHING interesting in 2017, or acknowledged Miiverse's existence. Let's make something clear: The Nintendo Network (Nintendo's successor to Nintendo Wi-Fi Connection) will be able to run independently of Miiverse. The ability to play things online and the ability to access Miiverse are two different abilities. They incur different costs on Nintendo's end. If the whole Nintendo Network were to end, then yes, Miiverse would go down with it, but there would also be lots of other issues that go along with that. But that is not what's happening. I would say “calm down”, but... Miiverse itself ending is still a tough pill to swallow. I mean, I'm pretty famous. I have over 11,000 accumulated Yeahs across my nearly 500 posts, and almost 700 followers. My main objective between now and when Miiverse ends is to not get banned a third time. That's a bit hard with people trying to get me banned via report-bombing, but the good news is the false-reporter that's after me reported literally all of my posts going back to early 2013, and despite almost 20 violations as a result of their reporting spree, I'm not banned yet. Perhaps the Miiverse administrators don't ban people for violations that occurred before the date of one's previous ban? Here is the one violation I have had since after my second ban that was not caused by the false reporter, who started at the end of June to continue into July. This one happened at the beginning of April. The admins didn't appreciate the over/under pun. I'll keep the details of the false reporter's antics, and their identity, a secret on these KoopaTV pages. ...Unless I do get banned for a third time. In which case, he'll get a whole article dedicated to exposing him. ...Jeez, that threat makes me feel like CNN. 7/19/17 Update: I just want to note that Miiverse's predecessor, the Nintendo NSider Forums, had absolutely NO WARNING when it was announced that it would enter a read-only state, and then only one week until it was wiped out entirely with no archive. So for those who think Nintendo will give very ample warning in an announcement about Miiverse closing, history doesn't support that. Again, go follow Ludwig's Miiverse account. Along with not wanting to get banned a third time, he wants to be able to get above that 700 mark. Actually, he wanted a four-digit Follower count, but that won't happen unless he breaks his own modus operandi and becomes a gross Yeah-bomber and Follows a thousand random people. Surely, at least one third of those would Follow him back! 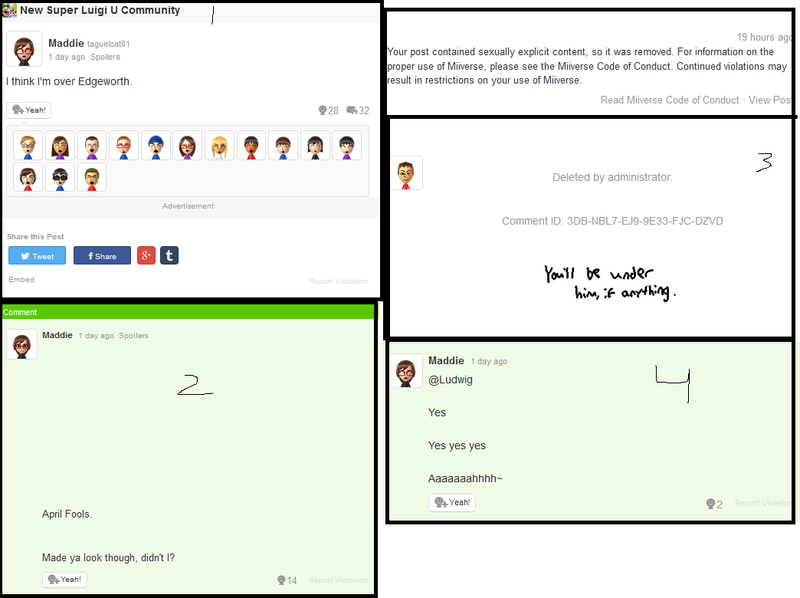 Outsourcing Miiverse moderation to third-party companies would contradict what a Nintendo representative told Ludwig about the moderation being a Nintendo back-office. Miiverse isn't the only thing ending in an indeterminate time frame. The program used to make the screenshot in this article, Paint, is also suffering the same fate. Miiverse will officially be ending in as soon as November 2017. Good thing that, unlike NSider, there is ample warning. At least you're more overt and honest about your threat than CNN was. :P If you're going to throw weight around, don't pussyfoot about it, that's what I say! Threatening someone while pretending not to is flaming hypocrisy, and if there's one thing I can't stand it's hypocrisy! 3247:45 play time, 6491 times. 937:13 play time, 694 times. So, yeah, I'm not going to pretend to not be unhappy about the thought of Miiverse ending, but there is no timetable to it, so... I'm not gonna act all depressed about information we all already knew. So Miiverse is a lot more lenient than NSider. The trade-off is that you could actually talk to the people who banned you. The only reason I still visit Miiverse is to view the artwork of some of the profiles I follow. I do not know how some are able to create great masterpieces on such a small screen but they do and they amaze me each time. 'cause they spend hours on each drawing, and I wonder where they find the time to sit there and do art for hours on end. Especially if it's the black-and-white Miiverse drawing posts and not from Art Academy, in which case you're not allowed to leave the screen. So many I befriended on Miiverse is going to be affected by this. It is for me to remember some time that I am almost 30 and so many are still kids with very restrictive parents not wanting them on other Social Media. Some even sneak Miiverse too because even some parents are strict with them about it. I am getting their 3DS codes secretly to continue on Swapdoodle. Swapdoodle is a crappy replacement, but I guess that's why I'm suddenly getting doodles from you. BTW we're gonna have multiple articles on Miiverse in the upcoming days/weeks so stay tuned.